GasTapper Gravity V is a powerful hand siphon that also comes with a bypass line so once the siphon is started, you can open up the bypass to use gravity for transfer. This a great and affordable alternative to the GasTapper 12V sold here on Amazon. All fittings are over-sized to increase fluid transfer. Intended to help move gasoline, other fuels and water without having to siphon or get a mouthful of gas in the process. Move gas from one gas tank or container to another. It has the added capability of being able to transfer fuel out of many cars. This ability allows vehicle owners access to their own fresh fuel as needed around the home, while camping, filling recreational vehicles, small engines and emergencies. GasTapper Gravity is a manual pump. It will start a siphon flow and then you can open the bypass line to move fuel rapidly. The bulb has high quality tight valves which allows you to actually pump fuel above the source. 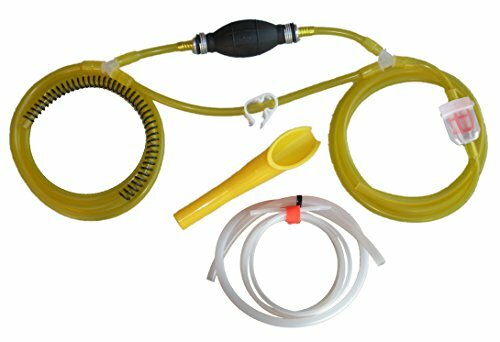 Equipped with a special funnel designed to open cap-less gas tanks and tanks with metal flaps, Spring end to help retain hose, 11' of FuelFlex® 65 3/8 inch Fuel line, 1/4 inch 6' modern car adapter line for accessing difficult cars, 1/2" 3' guide tube to aid in modern car access -Top quality siphon bulb with aluminum ends and rubber valves. This is not a throwaway tool. It is well made. No competitor on Amazon makes the "real" fuel line claim. It makes a big difference on longevity. Tested vehicle list on our website. Attention California Residents: "WARNING: This product may contain chemicals known to the State of California to cause cancer, and birth defects or other reproductive harm." If you have any questions about this product by GasTapper, contact us by completing and submitting the form below. If you are looking for a specif part number, please include it with your message.